Where to receive spinal treatment is an extremely important consideration for anyone looking into having spinal surgery. At ProMedSPINE, we aim to provide the absolute best care possible to each patient. Visiting from another city, state, or country should not be a hindrance to choosing the best doctor. With that in mind, we offer VIP services for out of town patients. We want to make your experience with us as smooth and as comfortable as possible, starting before you even reach Los Angeles. With our VIP service, our staff can assist you in booking your flight and hotel stay. Our state-of-the-art facilities are located in Beverly Hills, Encino, and Valencia which are home to some of the best hotels in the Los Angeles area. There are also many world-class restaurants nearby, as well as high-end shopping and tourist attractions. We want you to have a relaxing, enjoyable stay and that includes minimizing any stress associated with travel arrangements and after-care. You can put yourself safely in our hands before you even arrive at our facility. Our facilities boasts the most comfortable, technologically advanced accommodations in a luxurious setting. We pride ourselves on patient care, and make the utmost effort to create a comfortable and inviting environment for all visitors. Once at our state-of-the-art office, our welcoming and knowledgeable staff will guide you through each step of your treatment to ensure maximum comfort and ease. Dr. Gravori is a double-certified spine surgeon and neurosurgeon specializing in minimally invasive surgery and pain management. 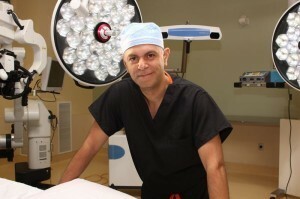 He received his education at UCLA, where he also did a neurosurgery residency. He received medical training at the University of Rochester, and he completed a dual orthopedic and neurological spine surgery fellowship at the prestigious Cedars Sinai Medical Center. Dr. Gravori believes that complex surgeries should only be a last resort, and he always places prime importance on what’s best for the patient. In order to minimize downtime and save costs for the patients, Dr. Gravori utilizes cutting-edge, minimally invasive, proven effective procedures. Improving his patients’ wellness and quality of life is his mission. Take the first step towards improving your health and wellness in Los Angeles by contacting ProMedSPINE today. You can trust that you will be in the most capable hands with our spine surgeons, and our caring staff is committed to providing each patient with the highest quality care. Schedule a consultation today by calling ProMedSPINE at 888-75-SPINE! Next, read our spinal surgery FAQ!